Welcome to another edition of Journey Through Comics. After writing the content of last week’s piece as well as the writing for what’s below, it occurred to me that I had more to say about each individual issue than what I had initially planned or had made time for. And due to the formatting of these articles, both with my text and the images, what you’d end up with is a lot of scrolling. So for now, what I intend to do is publish an article for issue two below and hold off on the others until next week, while I figure out the formatting so that what we have is a page that operates as a sort of table of contents and then I can publish in chunks what amounts to be five chapters a week. For now, here is issue two. Issue two opens just a few moments after we left off. Ross is still in a broken down apartment, and now a large demon, Mephisto, has come to visit. Very quickly, Ross’ narration get the reader caught up to speed. The reason for this quick recap is due to the monthly release format of comics. But it also works within the collected format due to the way the narrative jumps around. Last issue, we seemed to be going back further and further in time, but Black Panther #2 introduces a number of events that happen between the gaps, and we realize just how long a night Ross has had. We very quickly cut to Black Panther and his Dora Milaje harassing another group of thugs. This scene is meant to echo the scene in issue one; Panther gives the same “We will have an understanding between us” speech, and his transformation back from his costume into his suit directly parallels his donning it in the previous story. This artistically sets a pattern of behavior for the character, something important when a writer is trying to establish who a character is and what they stand for. This scene serves as the foundation of a highly motivated and highly effective hero. T’Challa is moving to obtain information and there’s an urgency to his actions. 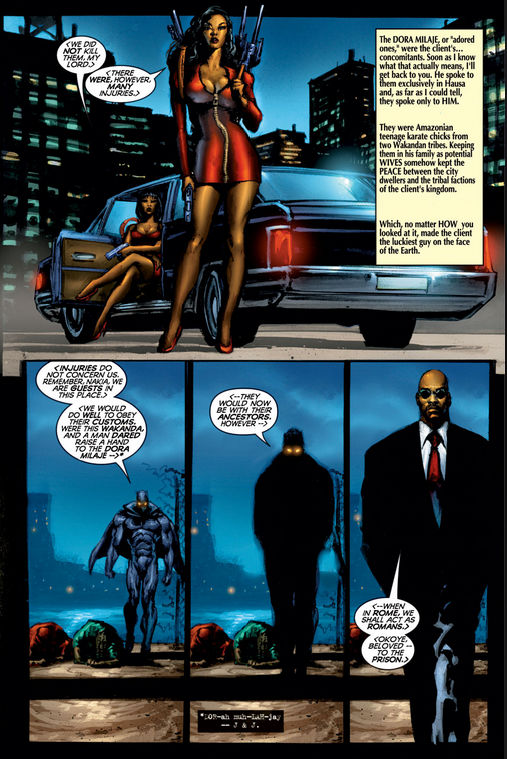 Also of importance is the dialogue between T’Challa and his Dora Milaje bodyguards. T’Challa inquires whether or not they killed the thugs, and they confirm that they did not. This not only establishes that killing an enemy is the taught behavior for these young girls, but it demonstrates that T’Challa does not fully trust them to modify their behavior here. This lack of trust, however small, will come into focus later. Very quickly we return to Ross and Mephisto, where the demon reveals he’s waiting for T’Challa to arrive. We then cut back to Ross relaying this story to his boss, Nikki, before jumping back to the beginning of his day, when he first picks Black Panther up. 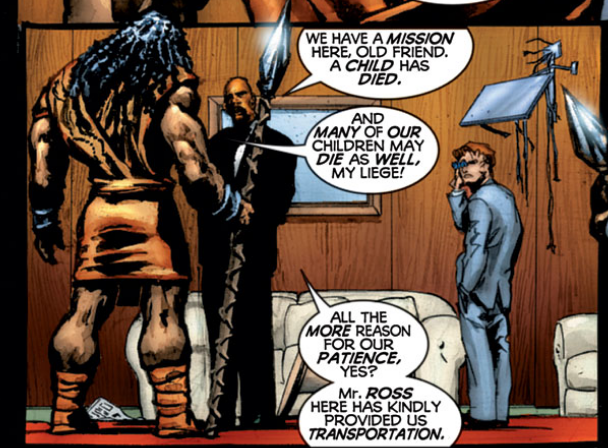 The joke played is that Ross went to pick up T’Challa in his two-seat convertible, when the king brought a large entourage with him, but it’s important to note that the reader has no idea of who these people are at this point, and there are at least thirty individuals waiting when Ross arrives. So while the reader has met T’Challa and his Dora Milaje at this point, the “Client” has more than just his personal bodyguards with him. The reader is to assume, at this point, that these other representatives are here because of the gravity of the situation. The poster child of a charity backed by the Wakandan Consulate was murdered, so of course there’s going to be a big show. T’Challa is taken from his thoughts by Ross’ introduction, who is promptly interrupted by Zuri, eager to get back to Wakanda to help with the uprising caused by Achebe. Zuri has primarily been a background player thus far, but he’s an important one. According to Ross’ narration, he was a good friend of T’Chaka, T’Challa’s late father, and has appeared briefly, mainly as an adviser to T’Challa. But his physical presence needs to be noted; this man is huge. He appears to stand about a foot taller than everyone else, and his bulking frame eclipses even T’Challa’s superheroic physique. His interplay with T’Challa is intriguing. By all means, Zuri looks like he could tear T’Challa in two so it is noted that when he speaks to T’Challa his body language suggests deference, even when his cause for concern is great. One of the best scenes in this issue consists of Ross and T’Challa ordering from a food stand. Zuri throws a temper tantrum and Ross deftly attempts to calm the situation down by addressing the foodstand owner in Cantonese. The twist comes when it’s revealed the man doesn’t understand what Ross is saying and T’Challa speaks to the owner in Tagalog. This scene works on multiple levels. First, it highlights T’Challa’s worldliness. He’s a king of an African nation, but can both understand Cantonese and speak Tagalog, a language from the Philippines. This demonstrates that, while his nation is depicted as isolationist, T’Challa is properly equipped to interact with outside countries (both Eastern and Western) that may have prospective business dealings with Wakanda. Furthermore, the scene shows that Ross, while clumsy and too quick to assume, is not incapable. This is a man who can do his job, he just isn’t always the best at it. This is important, because narratively Ross functions as a cipher for the reader. 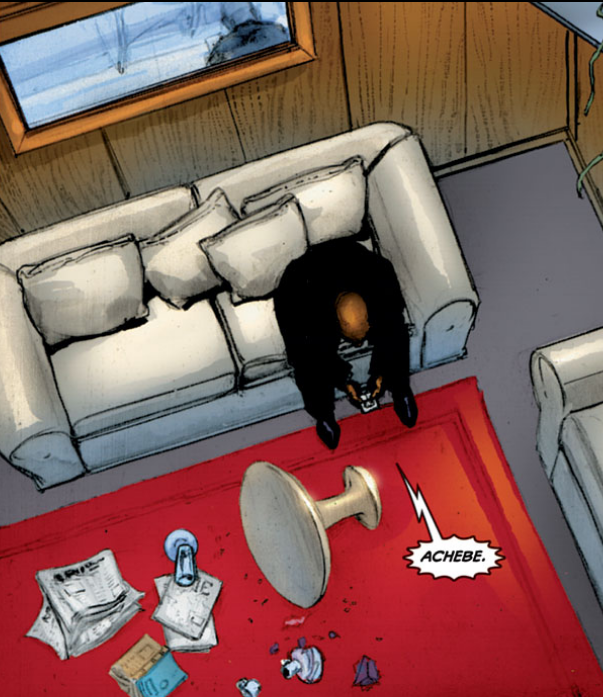 He makes lots of misjudgments about who T’Challa is and what he’s able to do without getting to know him. 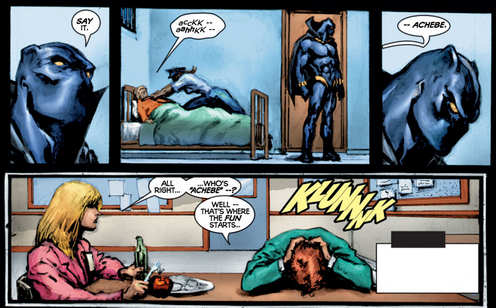 T’Challa’s upstaging of Ross puts him above Ross’ reproach and on a meta level, above the reader’s reproach as well. And it does this without forcing T’Challa to come off as smug within the text. The scenes that follow are a fun and exciting adventure that takes us through the rest of the night. The reason this sequence works so well is that due to Ross’ scatterbrained narrative, we’ve seen pieces of this before, but never in a way that really made sense. But now we get to see how Ross lost his pants, how he, T’Challa, the Dora Milaje, and Zuri got arrested, as well as why T’Challa was investigating these low-time criminals. As it turns out, his investigation of the thugs all night has led to the reveal that the Executive Director of the Tomorrow Fund, Marion Vicar, was behind the child’s murder. T’Challa has Vicar beaten by one of the Dora Milaje until she gives up the name of the person who orchestrated the incident to draw T’Challa away from home.